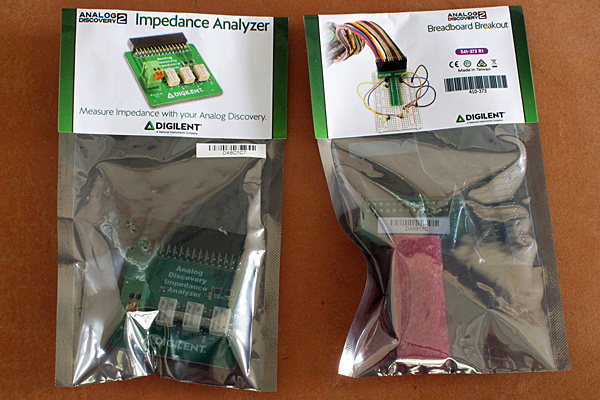 One of the new toys I got this week was the Impedance Analyzer board for my Analog Discovery 2 (I also got a Breadboard Breakout, but I won’t discuss that in this post). Here they are in the bags they shipped in. And here they are unwrapped. I tried testing out the impedance analyzer board today, to see how well it worked, and to try to determine the precision of the reference resistors they used, since Digilent does not seem to have provided that information on their datasheets. The impedance analyzer board is used just like any other setup for using the Analog Discovery impedance meter: you select the reference resistor and the range of frequencies, run open-circuit and short-circuit compensation, then insert the impedance to measure and do a sweep. The only difference is that the board uses latching relays to select the reference resistor, rather than having to wire it yourself. The board has 6 resistors: 10Ω, 100Ω, 1kΩ, 10kΩ, 100kΩ, and 1MΩ. I did several tests, many of which seemed rather inconclusive. One fairly consistent result was that the open compensation saw the open circuit as essentially a 1.63pF capacitance. One exception was the 10Ω resistor, which reported 5.4pF, but I suspect that is due to measurement error from quantization—as 1.6pF at 1MHz is still about -j 100kΩ and the 10Ω resistor would have only 0.001 times the voltage across the open circuit. These capacitance measurements were only consistent above about 3kHz—at lower frequencies I had rather noisy results, probably again because of quantization problems measuring small voltages across the reference resistor. The short-circuit compensation reported values roughly proportional to the size of the reference resistor, with a maximum around 24mΩ for the 10Ω reference to 148Ω for the 1MΩ reference. The impedance changed a lot with frequency, with a maximum around 18kHz. The phase change varied a lot with frequency also. 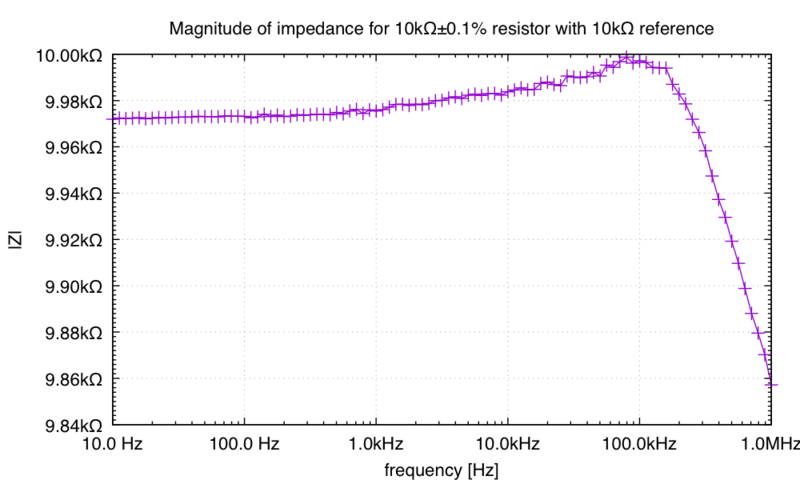 The impedance of the 10kΩ±0.1% resistor is not constant with frequency. This plot has a linear y axis, to accentuate the fairly small change that is measured. 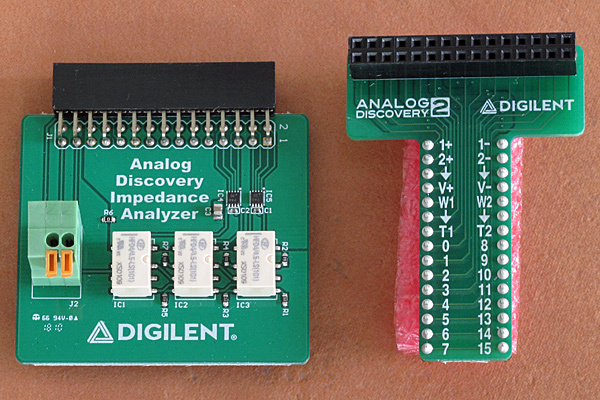 The results are best when using a reference resistor within a factor of 10 of the resistor being measured, and those results seem to be within about 0.2% of the correct value, which suggests that Digilent is using 0.2% resistors (or that they got very lucky with standard 1% resistors). The one set of bad values is from the 10Ω reference—the resistance of the relay contacts may be big enough to throw off that measurement, though I would have expected measurements to be too big, if that were the source of the error. It is really useful to have this type of evaluation. I have a question: How did you set the parameters in WaveForms using the Impedance Analyzer tool? In the current Waveforms (3.8.17beta) those options are under the “Options” button on the toolbar. I think that’s where they were in earlier versions (since the creation of the Impedance tool).